Readers of this blog will remember Green MEP Sven Giegold as a staunch campaigner against the excesses of the finance industry and for his attempt to discover the most destructive so-called 'financial product'. Now Giegold is celebrating another success: his campaigning to open up the festering sore that is the global tax system and to shine the light of transparency into the dark recesses of global tax havens appears to be contributing to change in the EU finance regime. German Finance Minister Schauble, who had longed campaign to maintain banking secrecy, turned the tables during discussion in Dublin last Friday and argued for a new regime of transparency so that all data relevant for taxation purposes must automatically be made available to the tax authorities in the home country of the foreign investor. Campaigning by Greens and Socialists in the European parliament had created sufficient momentum to undermine the long pact between German finance ministers and the gnomes of Zurich who they had been sheltering. You can watch the press conference here: George Osborne's discomfiture is particularly enjoyable. The message of the press conference is that the members of the EU will set the standard of financial transparency, and will then expect other countries to reach this standard. 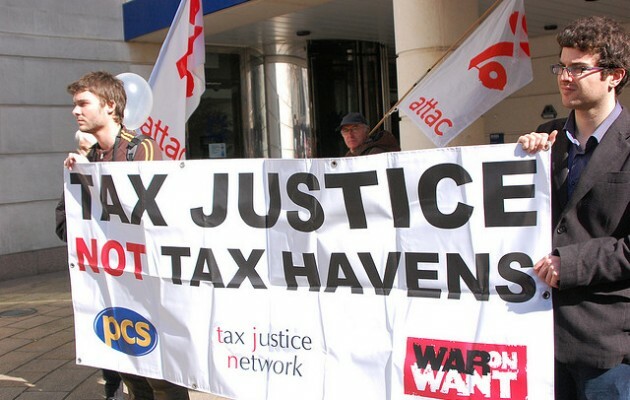 This would appear to be a significant challenge to the world's tax havens, at least those that rely on secrecy. Amazingly, and with no apparent irony, the agreement is called FATCA, with just a missing letter to get to the real heart of the matter. In these days of austerity the pressure is on for all to pay their share, so we should not be immediately sure that these fine words will butter the necessary legal parsnips. It was when I heard that 'Italy has always been committed to fighting in the field of tax evasion' coming from the lips of Italian finance minister Vittorio Grilli that I wondered whether Sven was being somewhat naive. But hey ho, even hearing these suited guys who have for so long taken the side of bizniz without question talking tough on tax evasion is an enjoyable change and it looks as though even arch-nemesis of the tax cheats Richard Murphy thinks that we are getting somewhere. The race to the bottom in terms of corporate tax rates must become the next objective.